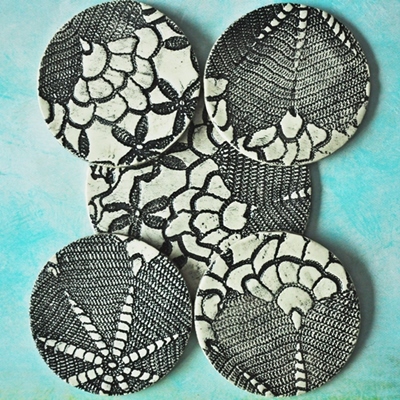 4 coasters and 1 trivet, hand made from white stoneware clay. Vintage lace was pressed into the wet clay. After firing in the kiln, a wash of black stain was applied, followed by a clear gloss glaze. The pottery was then fired a second time at a higher temperature. Coasters measure 3.25" (8.25 cm) across. Trivet measures 4.75" (12.06 cm) across.